A quick look back on the week that was of college football, along with a shot at the projected BCS standings for the next day. For the football played, the losses suffered and wins gained, how much have we actually learned about the contenders from opening weekend to today? Weekend to weekend, the upsets have occurred, but we stand at the precipice of the season’s first BCS rankings seeing the same kind of BCS déjà vu. 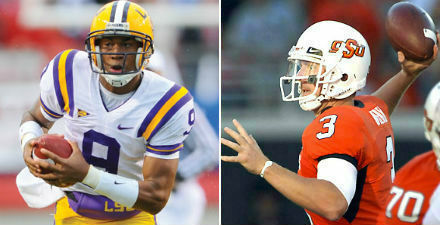 For better or worse much will be familiar in Sunday’s first BCS rankings of the year. An SEC team will debut at the top of the BCS. Alabama has made that much certain with the way they’ve run the table thus far this year. Relatively shoddy (fourth or fifth as opposed to first) computer support leading up to the first BCS rankings should be of no concern to Alabama’s hopes or the Tide faithful. Play like this against the SEC, and the spot so familiar to the Tide at this point will remain their’s. Chasing the Tide is a group so wide that the season will have plenty of intrigue down the stretch. First among the contenders is, unsurprisingly, No. 2 Oregon, which enjoys a wide-spread support among pollsters and growing support in the computers as the season progresses. Again, the recipe for the Ducks (you may need to read that twice) is to win out to make the championship game. The real intrigue will likely start at No. 3. The two combatants? Familiar names, but unfamiliar in recent seasons to the BCS conversation — Notre Dame and Florida. Both enjoy heavy support in the computers. And with West Virginia and South Carolina out of the way in the human elements, the two will battle tightly for the No. 3 spot tomorrow. Either could take it. For now, let’s go with the SEC’s wider-spread support in the computers and among voters to give the Gators the edge they’ll need to grab the No. 3 spot. The Big 12 deposits a few teams in the top 12 tomorrow, starting with the conference’s lone remaining undefeated, Kansas State. The Wildcats could easily claim the fifth spot, chased by the top-tier group of one-lossers. That group includes South Carolina, LSU and Oklahoma, all of which will be rewarded heavily for staying mostly on course — and having some key wins across the board in recent weeks (South Carolina over Georgia, LSU over South Carolina, Oklahoma over Texas). Any of those three could land in the spots six through nine. But for now, the SEC teams will still get the benefit of the doubt. So we come to the symbolic midway point of the college football season — the first BCS rankings. Are there many surprises? No. But the intrigue remains. You’ll want to stay tuned. After last week, it felt like it wouldn’t have been a surprise to see every favorite in the nation get upset and throw the BCS into chaos once again. It wasn’t to be, however, as favorites around the country prevailed throughout the extended Thanksgiving weekend, although some did have some trouble in the early goings and set up a drama-filled final weekend. Even LSU had relatively little trouble with last week’s BCS No. 3 Arkansas. So the BCS standings aren’t going to be very shaken up come Sunday night, but the implications haven’t been bigger this season. 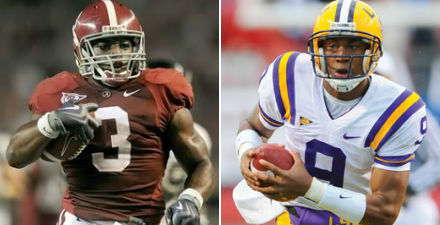 Not surprisingly, LSU and Alabama will be set to stay atop the rankings. Alabama, despite missing the chance to play in the SEC title game, is likely secure in its positioning to make it to the BCS title game. 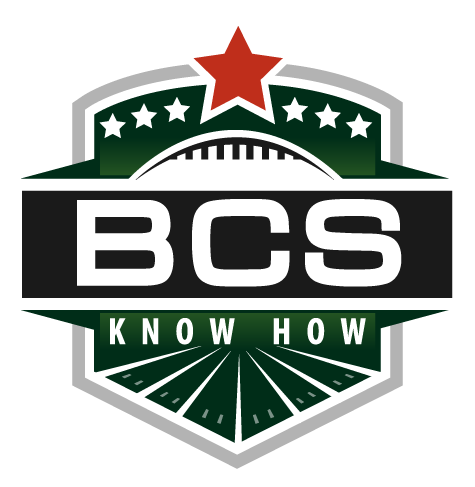 Of the five teams to finish in the top two in the seventh BCS standings who didn’t play in the season’s final week in the BCS era, all have made the title game. LSU will still have to beat Georgia to absolutely secure its spot in the title game, but of course, there are scenarios where a loss would still give the Tigers a chance at the BCS national title. Who would take LSU’s place if they were to fall out of the picture? Well, it wont be Arkansas, which will take a fall after its loss to LSU, but it shouldn’t be too harsh. Arkansas’s computer support should remain strong, and a loss to LSU in Baton Rouge shouldn’t sway voters away from the Razorbacks too much. It could be new No. 3 Oklahoma State, who will be the main benefactor from Arkansas’s drop. With strong computers support and likely resurgent human poll support, the Cowboys might recover nicely from their loss to Iowa State last weekend. And with a strong victory over Oklahoma next weekend, the Cowboys will have a compelling case for a shot at the BCS title. 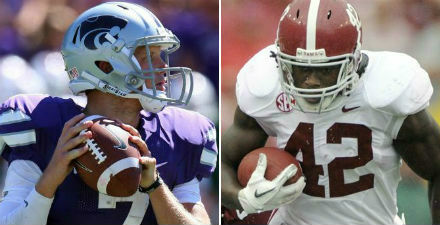 But a compelling case might not be enough to overcome behemoths Alabama and LSU this season. Virginia Tech, Stanford and Arkansas should fill in spots four through six, followed by Boise State and Houston, with little differential changes from last weekend, the only difference being Arkansas’ small drop. Many will be looking for BCS bids next weekend, both at-large and automatic, including Virginia Tech’s attempt at another ACC champion; Stanford and Boise State’s quests for at-large bids, and Houston’s hopes for the automatic bid given to the highest-ranking non-AQ conference champion. 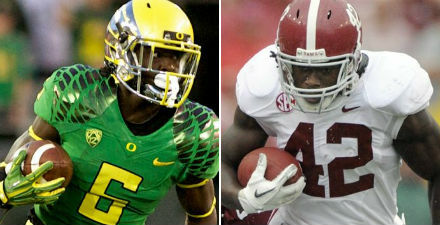 Oklahoma and Oregon should come in at Nos. 9 and 10, although either could finish ahead of the other depending on human poll support tomorrow as the distance between the Ducks and Sooners was quite small last weekend. Editor’s Note: These projections are for the November 20th, BCS week six standings, to see the November 27th, week seven projections, CLICK HERE. There are college football weekends. And then there are the college football weekends we’ll remember as season-defining. This was one of them. Oklahoma State, Oregon, Oklahoma and Clemson were all victims of upsets in one of the most incredible, unpredictable and awe-inspiring weekends in recently college football history. When it was all over, however, the talk turned immediately to the BCS. What more can be said about the chaos we’re about to encounter? A whole lot. More than obviously, LSU will be on top once again. The Tigers are aiming to go wire-to-wire with this thing. Next, and not surprisingly, you’ll find Alabama, the beneficiaries of teams falling all around them, while the Tide were barely punished after their one loss of the season — to LSU. Third you ask? Well, how about another SEC West team, Arkansas. All but forgotten in the commotion over ‘Bama and LSU, the Razorbacks just keep climbing and will be right in the middle of the conversation come tomorrow. And with a game against LSU looming Thanksgiving weekend, we’re not out of the woods in terms of controversy and chaos quite yet with the Razorbacks. The teams that took that big fall this weekend will start filling in spots after that. Oklahoma State, Oregon and Oklahoma will be a part the next sector of teams, all with lots of work to be done if they want to even think about the title game. Oklahoma State does have the computer support to maintain overall BCS support, and will likely just fall just two spots to No. 4. Virginia Tech and Stanford, forgotten in all of the mess of the BCS this season, will both be suddenly thrust back into the conversation, although on the outside looking in in terms of a birth into the national title game. The non-AQ darlings, Boise State and Houston round out the top 10, although it is the Cougars, and not the Broncos, in the driver’s seat for the automatic bid afforded to the top ranking conference champion of a non-AQ conference. Neither has the computer support to break into the title picture anymore. It’s gotten as crazy as it has ever been this late in the season. Could we actually have a rematch in the BCS title game? We’ll just have to watch these last two weekends of college football with bated breath.